Purchasing a log cabin is an exciting decision, but one which requires careful thought and consideration. It’s important to be aware of all the necessary information to ensure you are making the best choice for your home. There are many factors to consider before and after you purchase your log cabin. Why Buy a Log Cabin? Log cabins are a versatile addition to any outdoor space. Not only do they provide extra space to focus on work, leisure or entertainment, they’re also a stylish feature for any garden. Garden buildings can offer you the same potential and possibilities of an extension, at a fraction of the cost of home renovation. Log cabins are ideal as entertaining rooms, games rooms, craft rooms, bars, gyms, home offices and outdoor living rooms. They’re perfect for giving young adults or children their own space away from the family home, or even operating a business. Log cabins add value to your home with their attractive designs and practicality. What are Log Cabins Made From? Log cabins are manufactured from timber logs. With all wooden garden buildings, the most important component is the timber itself. The quality of the wood will have an impact not only on the appearance of your building, but also its longevity. The best timber for garden buildings is slow-grown. This means that the wood has increased density, improved durability, and is less prone to warping or splits. Log cabins are made of interlocking logs which join to create a solid structure with no visible gaps. A tight fit between logs results in a building that is more resistant to damp and wind penetration, extending the life of the cabin. If you plan to use your building year-round, it may be beneficial to choose a log cabin with thicker logs – especially if you live in a colder climate. 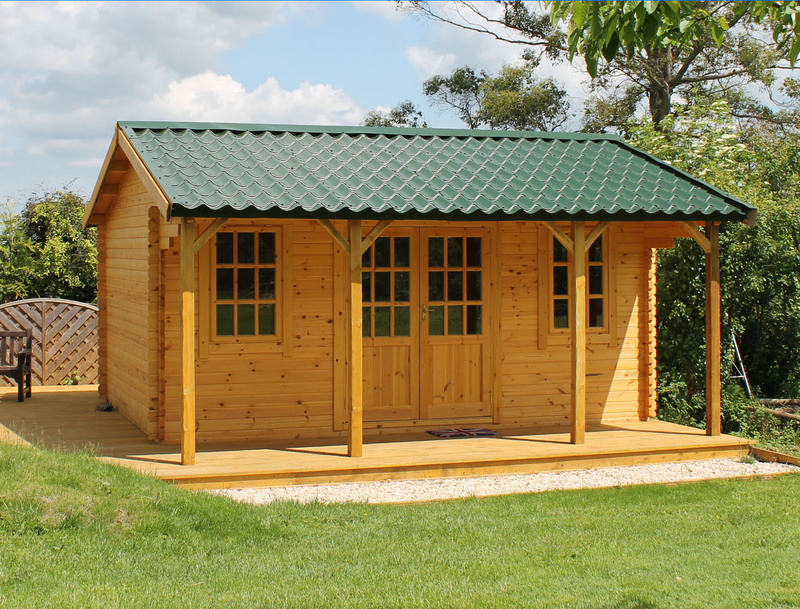 Log cabins are available in a variety of thicknesses; we have buildings manufactured from 19mm, 28mm and 44mm logs. 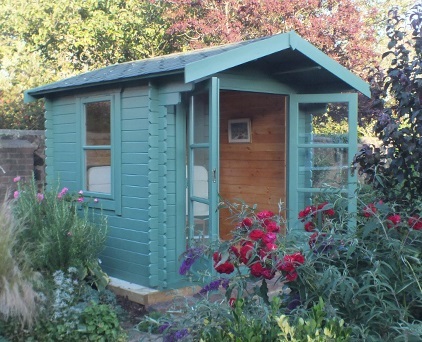 19mm log cabins tend to be on the smaller side, making them ideal for more compact gardens. The walls are thicker than that of a shed, and if you wish to use your log cabin as a summer house on warmer days, you may find 19mm to be adequate for your needs. These buildings are half-way between shed-style summerhouses and heavier cabins. Despite being the more budget-friendly option, high quality 19mm cabins will still be sufficiently strong and sturdy. 28mm log cabins are the next step up from 19mm buildings. The increased thickness provides increased robustness and improved heat retention. While 28mm log cabins can be used year-round in mild climates, they are best suited to spring, summer and autumn. These log cabins tend to be available in more sizes and styles than 19mm buildings, with more opportunities for customisation. 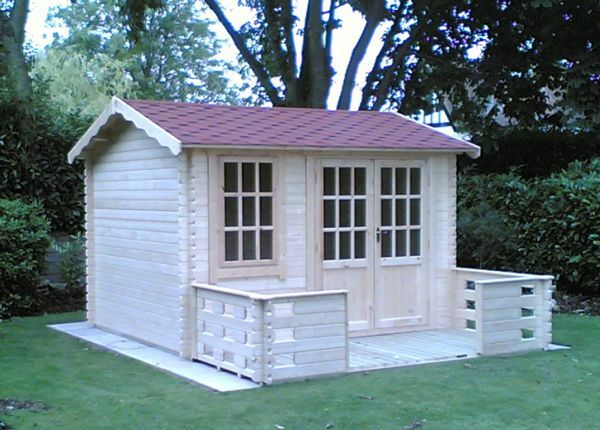 44mm log cabins are ideal for use in all seasons. The timber is thick enough to protect against heat loss and provide insulation in winter, while also providing the perfect outdoor space to relax in summer. 44mm log cabins have increased strength and durability and are available in a wide range of stunning designs to upgrade any outdoor space. The double tongue and groove log system firmly interlocks for a cabin that is truly built to last. Tiger Tip: Tiger 28mm and 44mm log cabins use a unique, 4-way chamfered notch system to ensure a reliably secure, tight fit. Where Shall I Install My Log Cabin? 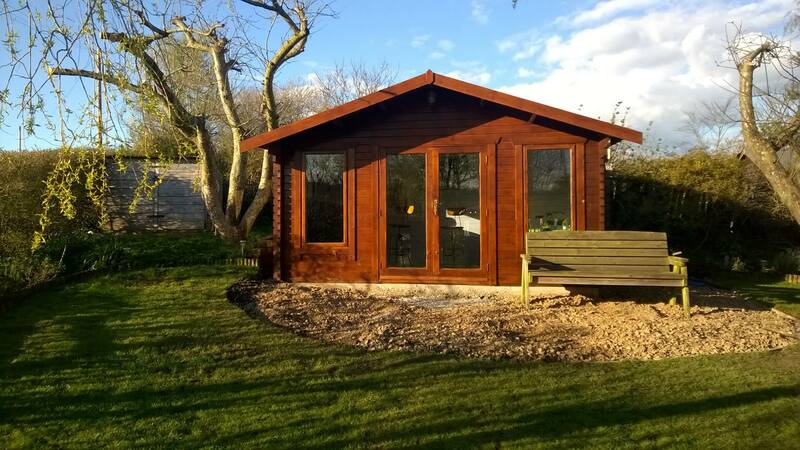 Before you can consider what size and style of log cabin you would like, you need to think about where you are going to place your new garden building. 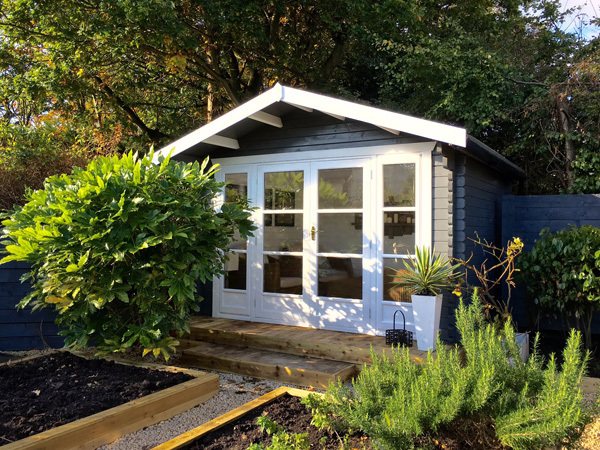 If you are planning on using your cabin as a summer house, you should think about installing it in the sunniest area of your garden to make the most of warmer days. Have a look outside on a sunny day and be aware of which areas receive the most sun. South-facing buildings will typically receive more sunshine, but make a note of any garden features which may cause shade, such as: trees, bushes, fences or buildings. While direct sunlight is perfect for a sunny escape, be cautious if you plan on using your log cabin to house technology, as exposure to excess heat can be damaging. If you’re using your cabin as an office, workshop or gym, an area out of direct sunlight may be better. If you wish to have power in your log cabin, it may be beneficial to place your building within reach of your mains electrics. Make sure that there is a clear path for cable to run over ground, or that you have a plan to install wiring underground. This should be discussed with a qualified electrician. Installing your log cabin facing an attractive area of your garden is a good idea. Think about what view you would like to have, especially if you are choosing a cabin with lots of windows. Tiger Tip: Do not install your cabin too close to trees or bushes, as branches could cause scratches in the felt, and foliage could trap water on the roof. If the cabin’s walls are repeatedly exposed to wet leaves, this could cause the timber to be damaged by the ingress of water. What Size Log Cabin Should I Buy? Once you have an accurate measurement of the space available for your log cabin, you should consider what size building you would like. It’s good to think ahead - if you will appreciate more space in the future, choose a size that could accommodate your changing needs or a growing family. The use of your log cabin will be an important factor to keep in mind when choosing a size. If you plan on creating a home gym, for example, be sure that the building can accommodate the exercise machines you choose. Furniture will be an important aspect of entertainment rooms, so give yourself enough space for chairs, sofas and tables. While a home office will probably only need enough room to comfortable fit a desk and chair, increased space improves flexibility. You could have a home office by day and games room by night! Extra space is also ideal to use for storage. You should consider the height requirements of your chosen equipment or furniture as well as the necessary floor space. Log cabin companies quote sizes in different ways. Their size could refer to the base size, the internal measurement, the external measurement, or the external measurement with the roof overhang. The difference between the external and internal dimensions could be significant, so be sure to double check specific technical dimensions and ask to receive a detailed construct diagram or floorplan showing all measurements. There is often a roof overhang on a log cabin, so this also needs to be taken into consideration. Check if the size of the overhang that is provided is from the face of the wall or the end of the interlocking log. If space is at a premium, corner log cabins are a great way to make the most of a corner. Tiger Tip: We can manufacture a partition to split your log cabin into rooms - perfect for if you want to create two spaces. What Styles Are Available For My Log Cabin? An apex roof provides the more traditional look of a log cabin. This design allows for increased headroom in the centre of the building. Many apex log cabins also feature an overhang to protect the building from rainfall. Make sure you do not install apex log cabins too close to a boundary fence, as the dual pitched roof could cause rainwater to pour into your neighbour’s garden. A pent roof offers a more modern design for a log cabin. The roof typically slopes backwards, allowing for additional headroom at the entrance. Many companies will give you the option of changing the configuration, so the entrance can be placed on the low side of the cabin. Off-set apex roofs are a hybrid between an apex and a pent roof. They provide a more unique silhouette for the building, with the charm of an apex roof and the increased entry headroom of a pent. The main advantage of this building is that it will usually be under 2.5 metres high in accordance with planning regulations. Read on for more detailed information on planning permission. Be sure to check what roof covering the cabin will be provided with, as some companies will not provide this as standard. High quality roofing felt will protect your log cabin from rain, wind and snow, and help to prevent damage caused by damp. You may also have the option to upgrade to shingles. Shingles provide a more attractive look to a log cabin and are harder-wearing. These will typically require less maintenance than standard roofing felt. We sell felt shingles in a variety of colours: black, red, brown and green. Tiger Tip: All our buildings are supplied with heavy duty, polyester-backed Power Felt as standard for effective weatherproof protection, with a green mineral finish. What Styles of Doors and Windows Can I Have? When it comes to choosing your log cabin, doors and windows are a large factor to consider. 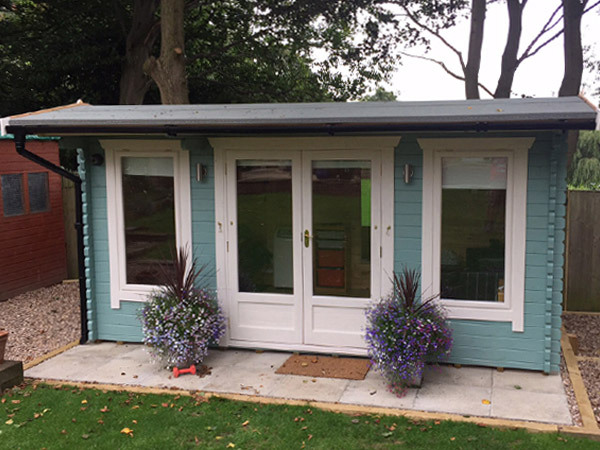 If you are purchasing your cabin directly from a manufacturer, you may have the option of creating a bespoke building – choosing which style of door and window, as well as where to place them. You can view our range of doors and windows here. If you are using your log cabin as a summer house, it would be beneficial to choose windows and doors which will allow your building to receive maximum sunlight. Fully boarded doors, however, are more suited to buildings used as a workshop or for storage. Make sure you consider which door is suitable for your needs. If you will be manoeuvring bulky objects in and out of your cabin, a double door will make your life much easier. Additional doors are a great way to create two separate spaces, especially if your cabin will feature a partition. Double glazing and toughened glass are available as upgrades and will have benefits of heat retention as well as increased security. You can also upgrade to opening windows if your chosen model does not feature these – perfect for a cool breeze in summer. Tiger Tip: If you would like additional windows or doors, or to change the configuration of the log cabin, please call our sales team so we can discuss your building. Will I Need Planning Permission for My Log Cabin? The log cabin must not have internal dimensions above 30m2. The log cabin, and other garden structures, must not take up more than half of the land around the house. The log cabin cannot be used as self-contained accommodation. Additional regulations are in effect for areas of interest (i.e. national parks) or listed buildings. For more information, please visit the government Planning Portal. 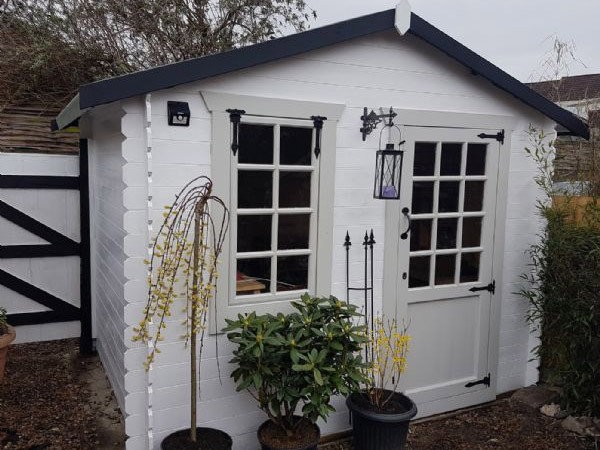 Tiger Tip: As buildings increase in size they tend to increase in height, but we can manufacture most of our garden buildings to be under 2.5 metres in height, if required. How Do I Prepare My Garden For A Log Cabin? It’s very important that you have a base prepared correctly prior to the installation of your log cabin. The quality of your base will have either a positive or negative impact on the life of your log cabin, and it can be hard to make changes afterwards - so it’s best to get it right first time. The base should be firm and level and constructed from a suitably durable material. The most popular materials for log cabin bases are paving flags and concrete. The base should be as flat and even as possible, so a spirit level is recommended. To be sure you can build an accurate base, consult the manufacturer’s website for the exact dimensions, as different companies quote sizes differently. Your base should be no smaller than the base of your log cabin, but not too much larger, as this could result in water pooling. Repeated walking to and from your log cabin could potentially damage grassy areas of your garden, so consider installing your building near an existing path or walkway, or building a new one. A minimum of 18 inches from any boundary fence or wall is recommended, as this will allow sufficient space to paint and treat your building. Also, if your building is too close to a fence or wall, this could lead to excess water on the timber – causing damp, mould and damage. Tiger Tip: While timber bearers are commonly used as a base for sheds, we would recommend that larger log cabins are installed on paving flags or concrete for their increased strength. If you have a small log cabin and want to use timber bearers, make sure to check that they will run the opposite direction to the floor joists on the cabin. Read our Build a Base Guide for more information. Log cabin companies will either deliver on a HIAB where the building is craned off in one whole pack, or delivered on a large vehicle with each piece unloaded one by one. Our log cabins are delivered on an 18-ton HIAB truck with an integral crane to unload the building. We will provide a delivery date in advance as well as a two-hour time slot of arrival. Be sure to check the delivery dates prior to ordering, as some companies will not provide a window of arrival. Prior to delivery, please inform us of any access issues and create sufficient space for the cabin to be unloaded. Tiger Tip: For more information on delivery, please click here. How Do I Install My Log Cabin? Many companies will offer an installation service as an additional extra. While cabin assembly is not particularly difficult due to the interlocking log system, it can be time consuming and requires a degree of DIY capability. Spirit level, electric screwdriver, wooden or rubber mallet, hammer, handsaw, retractable knife, stepladder, and a silicone sealant and gun. Tiger Tip: All the necessary fixings are included with our log cabins for a hassle-free installation. How Do I Treat My Log Cabin? Log cabins are typically manufactured from untreated timber. This means that the building will require thorough treatment – both inside and out – as soon as possible. Treatment with a high quality wood preserver is essential to prolong the life of the log cabin and to ensure it remains strong, secure and stunning for years to come. Beware of log cabins which are pre-treated, as this can modify the thickness of the log. The logs should be assembled untreated for a secure and accurate fit, and thoroughly treated afterwards. The underside of the floorboards should be treated prior to installation. There are many options available for treating your log cabin. You can choose a dedicated timber preserver that is clear or tinted, for protection that showcases the beauty of the wood. Alternatively, there are external timber paints, such as Cuprinol Garden Shades, that are specially formulated with an integral preserver. Timber paints will provide a colour that is more opaque than a stain, but will usually still allow the texture of the wood to shine through. Tiger Tip: When you are treating or painting your building, be sure to use painter’s tape to protect any fixtures such as door handles or hinges, giving you a professional finish. You should also take care to cover the glass of any windows or doors. Will I Need to Maintain My Log Cabin? Treating your building is a crucial aspect of owning a log cabin, but there are also other regular maintenance tasks that are important to perform. As discussed above, your log cabin must be treated with a high quality wood preserver. We would recommend that your building is re-treated annually. You should clear plants from the surrounding area to make sure that nothing is touching the walls. Take particular care to thoroughly treat the bottom logs around the cabin, as well as all corners of the building. Ensure that the treatment reaches inside and outside of every joint, and any area of machined timber. You should be sure to check your roof for build up of foliage or any other debris. Fallen leaves or branches could cause your roof to hold excess water and lead to the felt being damaged. There should also be nothing in contact with your roof, such as branches or bushes which could cause tears or rips. Ensure that you regularly check your felt for damage – especially after a storm – and act quickly to remove the affected area and affix a new strip of high grade, heavy duty mineral felt. You may need to adjust your storm brace so that the bolt is central. Timber is a natural product, and the logs may expand and contract over time with changing temperatures. You may need to unscrew the fascias of the doors and windows to allow the log cabin to relax. This also provides opportunity to make sure the doors are square prior to being re-screwed. While your base should already be perfectly level prior to installation, you should check to make sure that it has not moved under the building. This could lead to the timber twisting or doors going out of square. Tiger Tip: Head to our maintenance section for more information. How Do I Keep My Log Cabin Secure? Keeping your garden building safe may not seem as much of a priority as your home, but it’s important to think about how to keep your log cabin secure. It’s more than likely that your cabin will contain valuables, so you should be taking steps to protect the contents. Be careful not to leave valuables on show, such as televisions or computers. Hanging curtains is a great way to keep your possessions out of sight while also allowing you to add a touch of style to your building. If you can, bring any expensive possessions into your house when you are not using them in your cabin. 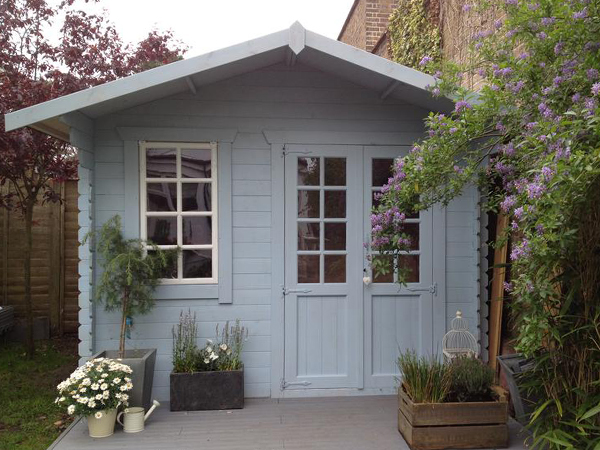 Alarms can be fitted in garden buildings relatively easily. Motion sensor alarms are a popular choice, and many also feature a light to deter any potential thieves. Be sure to check what lock will be provided with your cabin, so you can decide if you would like more security. You can purchase additional locks for your cabin door, such as hasp and staples and disc locks. Tiger Tip: Tiger log cabins come with a high security, three-lever lock as standard. You also have the option to upgrade to a five-lever lock at checkout, providing the highest level of security. If you're ready to buy your new garden building, have a look at our great range of log cabins. Need any assistance? You can give our friendly sales team a call on 0113 205 4189 who will be happy to help.